Tecumseh Junction. A small area where three railroad railroad companies came together in a small Michigan town. Mostly gone and forgotten today, but at one time a crucial part of the town and its commercial life. This blog is an exploration of the railroads in Tecumseh, and how those tracks set the author off on a journey which lead him half-way round the world. Tecumseh, Michigan—the red dot marks the location of Tecumseh Junction. Tecumseh, Michigan (pop. 7,045 in 1960) is a small town located in Lenawee County, 65 miles from Detroit, 35 miles from Jackson and 40 miles from Toledo, OH. Today Tecumseh mostly serves as a bedroom community for the Ann Arbor area, but from its inception and through most of the 20th century it was an important, independent farming and manufacturing town. 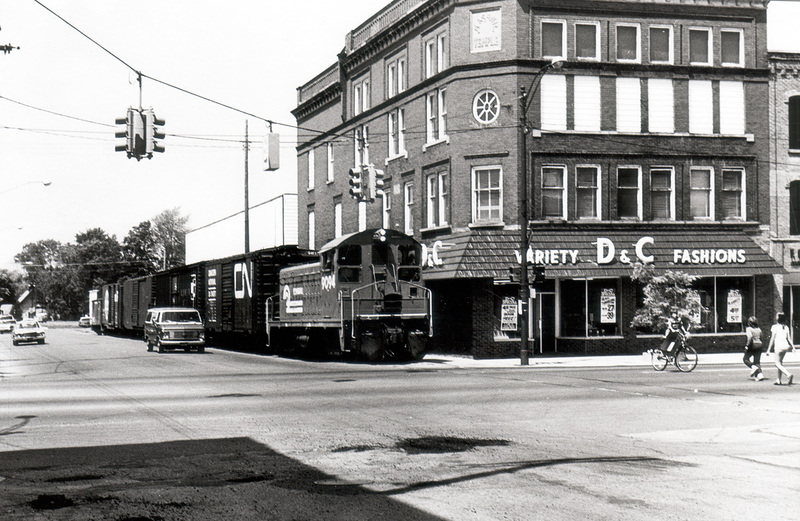 The north-south line of the New York Central (from 1968-Penn Central) ran right through the center of town, and my earliest train-related memories are of the local PC freight train on its daily passage. There were many grade crossings, and the line ran right beside Evans Street, so the train made its way through town without blowing its horn, but with the bell ringing the entire time. We lived a few blocks from the tracks, but the ringing of the bell and the slow speed of train always gave me a chance to run to the curb and look down the road for a glimpse of the passing train. A black switcher, five or ten cars, and a green caboose—and it was gone. The day’s excitement was over. It certainly wasn’t a rail scene full of action, but it was consistent, something you could rely on. Every weekday afternoon, at about 3 or 4 p.m., the sound of the bell could be heard in the distance, signaling the arrival of the southbound freight train. This continued, into the 70s, and even into the 80s. As I got older, I was able to ride my bike around town, and discovered more of the railroad landscape. There was the small yard by the Tecumseh Products Company with a line of box cars. There was the sagging wooden depot at Tecumseh Jct. Near Tecumseh Acres School there was the now-disused DT&I yard, where you could throw the switches for trains which would never come. On the north side of town there was a small bridge and a wooden loading platform. A hike north along the line led to the wooden trestle across the River Raisin. Lots to explore, many places to play. Through the years, my interest in trains grew and grew. Family trips to the UK introduced me to truly busy rail operations, and I have fond memories of British Rail in the 70s and developed an interest in international rail operations, which remains to this day. 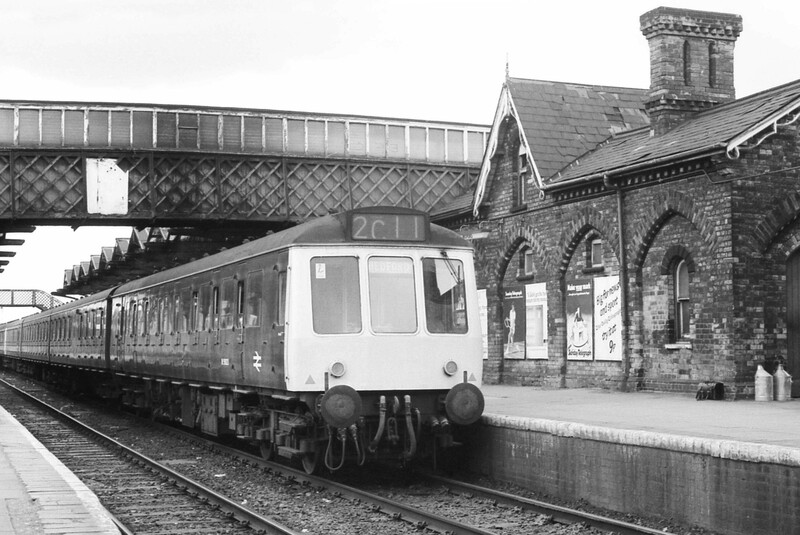 A British Rail class 127 DMU awaits departure from Bedford, UK station in the mid 70s. I spent many hours watching trains on this station. But I always came back to Tecumseh, and never lost interest in the trains passing through my town.